Celtic striker Leigh Griffiths has been charged with "provoking spectators" after he tied a scarf to the goal following Friday's 2-0 win at Linfield. The first leg of the Champions League qualifier at Windsor Park in Belfast was marred by incidents. Play was held up when a bottle was thrown at Griffiths and there was an attempted pitch invasion at full-time. Linfield have been charged by Uefa with the "throwing of objects" and a "field invasion". Scottish champions Celtic have also been charged with "improper conduct of the team" after they picked up five bookings. 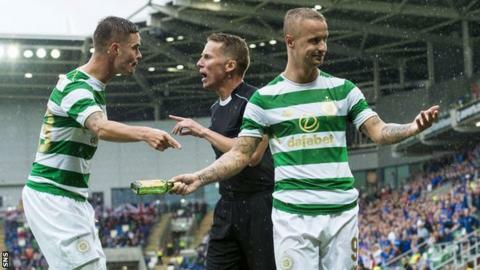 One of the players cautioned was Griffiths, who was shown a yellow card by referee Alejandro Hernandez as he picked up the bottle that had been thrown at him while he was taking a corner. Police with dogs were deployed at full-time to stop a pitch invasion. European football's governing body Uefa will deal with the case on 20 July, the day after the return leg in Glasgow. Celtic had decided not to take up an allocation of tickets for the game because of security concerns - but around 300 fans watched. Speaking after the match, Celtic manager Brendan Rogers said: "Players go onto the field and it should be a safe environment for them. You want the passion from the stands to stay in there - but if you take that away from it, it was a good evening." Police Scotland released a statement urging fans to remain "focused on the football" during the return leg. He added: "Anyone who is intent in causing disorder or hate crime can expect to be arrested by police."